Tori Tissell's novel pillow is printed with one of the most famous musings on the nature of love. Just like falling asleep with your favorite book, Tori Tissell's novel pillow is printed with one of the most famous musings on the nature of love. Known as "The Way of Love" from 1 Corinthians, this passage is a tender reflection on the beauty of true love and is a favorite reading at weddings. 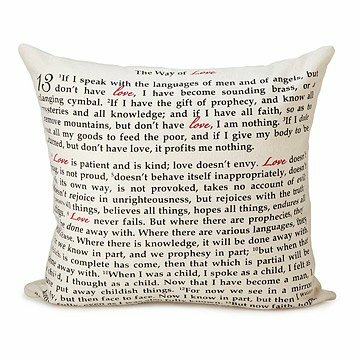 This downy handcrafted pillow makes a memorable gift for the well-read couple, and will add a bit of literary love to the bookworms' home. Handmade in Portland, Oregon, with cotton twill fabric from Los Angeles, California. spot clean pillow cover as needed or machine wash, cool water on gentle cycle. Hang or lay flat to dry. Iron if needed. So happy to find this! We purchased this as a gift, but we would also use it. Even though we don't normally favor decor with sayings or quotes, we would make an exception for this treasured passage from Scripture. Perfect gift for a second anniversary- prayer and cotton! It was given as a n engagement gift and was perfect for the occasion. Beautiful passage from 1 Corinthians 13 printed on off white fabric. Nicely filled throw pillow. Gave as a wedding gift--they loved it! My friend had me read this verse at her wedding. When I saw this pillow I knew she'd love it and she did! I purchased this pillow as a anniversary gift for my son and daughter-in-law. They let me know that they love it and it is sitting on the sofa in their family room. Excellent wedding gift for Christian friends. Good looking and the service was excellent.....speedy delivery. This pillow is for my daughter's 33rd birthday. She loves this scripture, and I know that she will be thrilled when she opens this gift. She'll treasure it forever. Spouse uses this for support while reading in bed.... very effective. Also very nice bed pillow - decorative. the text is clear, and it is an amazing valentine's day or anniversary gift.